Inside the Head of a Digital Pirate. What goes on in the head of a digital pirate who is hauled into court? A case in New York under the gives us a pretty good idea. Arista Records LLC v. Usenet.com, Inc., 2009 WL 1873589 (S.D.N.Y. June 30, 2009). All images of Johnny Depp aside, tis not a pretty sight. Arrrr. Mateys … Here’s what we do. We hide the treasure and destroy the evidence. No nay they’ll ne’er be able to convict us then. The land lubber lawyers and scurvey dog judges are too lily-livered to stop us. Aye. We gentlemen o’ fortune be above their laws. Aye. Information wants to be free; yo ho ho! Just so long as we gets our cut and not the Scallywags. Yes. The defendants in Arista Records LLC v. Usenet.com, Inc. probably thought something like this when the case started; but shiver me timbers were they in for a surprise. By the way, although this classic case goes back to 2009, the love of digital hackers for the pirate image continues. See eg; Silk Road’s ‘Dread Pirate Roberts‘ convicted of running online drug marketplace. The plaintiffs here are a group of record companies, a/k/a the RIAA. They sued Usenet.com, Inc., Sierra Corporate Design, Inc., and their director and sole shareholder, Gerald Reynolds for copyright infringement. Jerry Reynolds is, by the way, well known, but not much liked by the anti-RIAA community. Also, his company, Usenet.com, Inc., is not the same thing as USENET, a global system of online bulletin boards with a long and honorable history. The supposed infringement took place when users of defendants’ website accessed USENET to download copies of plaintiffs’ music. I say supposed infringement because the law is not yet clear as to whether and when such for-profit provision of access to copyrighted files by an Internet Service Providers (“ISP”) is illegal copyright piracy. See eg. : Cartoon Network LLLP v. CSC Holdings, Inc., 536 F.3d 121 (2d Cir. 2008); Metro-Goldwyn-Mayer Studios Inc. v. Grokster, Ltd., 545 U.S. 913 (2005); Sony Corp. of America v. Universal Studios, Inc., 464 U.S. 417, 435 n. 17 (1984). I am not an expert in this area, but I understand the strongest defense to this type of enforcement action against an ISP derives from the safe harbor protection of §512(c) of the Digital Millennium Copyright Act (“DMCA”). Note that this defense under the DMCA is for service providers, not for individuals charged with illegal music sharing, which seems to be nailed down by the Digital Theft Deterrence and Copyright Act 1999. Again, I am no expert on this, but as far as I can see, the primary substantive defense left for individuals is a constitutional challenge to that law, such as is now underway by Harvard Law Professor Charles Nesson in Sony v. Tenenbaum, Civ. Act. No. 07‐cv‐11446‐NG (USDC Mass.). See the interview of Professor Nesson and one of many articles on his challenge to the RIAA’s controversial enforcement actions. See also these key pleadings in the case: Tenenbaum’s Motion to Dismiss dated March 9, 2009, on constitutional grounds, and the Order Denying the Motion dated June 15, 2009; Tenenbaum’s Memorandum raising a fair use defense dated May 15, 2009, and the Order denying Plaintiffs motion to strike this defense, thus allowing the fair use defense to be heard by a jury. This whole subject, including the Tenenbaum case, is closely followed in the popular blog, Recording Industry vs The People, written by New York City lawyer Ray Beckerman. Naturally, the defendants in Arista Records, LLC v. Usenet.com, Inc. raised the DMCA safe-harbor defense and argued that the entire enterprise operated like any user-generated content site. That is, it was users (and not Usenet.com) that were uploading and downloading the infringing files. The DMCA’s Safe Harbor provision provides protection for ISPs from copyright infringement lawsuits as long as they take down offending material once they are served with a notice of infringement. If the defendants had played fair, they might just have won. But alas, we will never know because the defendants tried to hide the evidence and were caught. Their true colors were then made known to the judge, just as sure as if they had raised a Jolly Roger flag. The judge in question, Senior District Court Judge Harold Baer, Jr., was no lily-livered wimp as defendants may have thought. No, he is a native New Yorker. Once the pirate-like discovery misconduct was made known, Judge Baer slammed the pirates hard. He made them walk the plank by striking their only real defense, the DMCA safe-harbor, and entered summary judgment against them. Defendants counsel affirmatively advised Plaintiffs in a March 8, 2008 e-mail that Defendants would extract and produce Usage Data for newsgroups that contain the words “mp3” or “sound.” (See id. Ex. 6.) Nevertheless, after giving that assurance … On the very day that Defendants’ counsel agreed to produce Usage Data to Plaintiffs, Defendant Reynolds disabled newsgroups with the words “music,” “sounds,” or “mp3” in the title and the Usage Data for those files was lost. And so the background was set for Judge Baer to have a look at the discovery conduct of Reynolds and his crew. The record in this case is replete with instances of Defendants and their employees specifically engendering copyright infringement and targeting infringement-minded users to become subscribers of Defendants’ service. First, Defendants’ own former employees have testified that their marketing department specifically targeted young people familiar with other file-sharing programs and suggested they try Defendants’ services “as a safe alternative to peer-to-peer file sharing programs that were getting shut down” due to copyright infringement lawsuits and resulting injunctions. … Indeed, Defendants’ promotional literature, created by marketing specialists at Reynolds’s behest, stated that when Napster and Kazaa began to have problems from copyright owners’ enforcement of their rights, “[t]his made the way for Usenet to get back in the game.” … Defendants’ website also had pages devoted to certain popular recording artists and expressly promoted the availability of “FREE MUSIC” and mp3 files for download. Pls.’ SUF 20-26, 29; Goldade Decl. ¶ 18. Defendants were aware that the downloading free music was, at the very least, a principal reason for a substantial portion of their subscribers’ signing up for their service: their own consumer survey showed that 42% of responding subscribers identified downloading music files as a “primary” reason they used Defendants’ service. Arista Records LLC v. Usenet.com, Inc., 2009 WL 1873589 at *3. Reynolds used special wiping software to write-over the contents of seven hard drives of his key employees, thus permanently destroying their documents and emails. He told a series of changing dog-ate-my-homework type stories to try to explain why this happened. The stories went from we never used them before; we just purchased them wiped like that on eBay; to ok, we used them and wiped them; to no, we did not really wipe them, they just appear to be wiped because we upgraded to Vista. Testimony by forensic experts disproved all of the excuses and proved instead intentional destruction. Arr. The pirates did not see that coming. Reynolds fired other employees and got rid of their computers by telling the departing employees to take the computers as “parting gifts.” Arr. Such a generous captain, but the land lubbers did not fall for it. They made misrepresentations regarding the utilization of internal email, saying they were a small company and hardly ever used it. They used that excuse to explain why they produced so few emails. Arr. Once again the scurvy dogs did not believe it and were able to prove that they used email all of the time. The captain tried another email trick too, he told his crew to use Gmail, and not the company account, and then didn’t search the private Gmail accounts. This too was exposed when one of the crew, a real son of a biscuit eater, went and told the truth. Reynolds engineered the unavailability of his key employees for deposition by “causing them to travel to Europe on an expense-paid vacation” and attempting to convince them to remain out of the court’s jurisdiction until discovery closed. Arr. The ungrateful sprogs came home too soon and the truth came out. They provided misleading information as to the employment and whereabouts of defendants’ former president. Arr. The wench be in Davy Jones’ locker. They knowingly provided false responses to interrogatories. Arr. Everybody does it. They violated two court orders requiring disclosure of information related to the spoliated hard drives and missing employee computers. Arr. We swashbucklers have our own laws, we don’t have to follow yours. Plaintiffs’ evidence credibly illustrates a pattern of destruction of critical evidence, a failure to preserve other relevant documents and communications, and at best dilatory (and at worst, bad-faith) tactics with respect to Defendants’ conduct during discovery. You might well ask what were the defendants’ lawyers doing while all of this was going on? Were they pirates too and a part of the hide the booty scheme? Were they victims of the pirates, threatened by a walk on the plank if they did not do exactly as they were told? Or were they innocents, mere squiffies, kept entirely in the dark as to the dastardly deeds of their pirate clients? I am inclined to think the later. Neither Judge Baer nor Judge Katz criticized the lawyers directly. Their comments are all directed at the defendants, primarily Reynolds. It appears that the lawyers were duped by their far-too-clever client. This happens to all lawyers from time to time, although it seems to happen to some lawyers more often than others. *9 A district court has wide discretion to determine appropriate sanctions for discovery abuses under both Rule 37 of the Federal Rules of Civil Procedure and its inherent powers. Gutman v. Klein,No. 03 CV 1570(BMC)(RML), 2008 WL 4682208, at *11 (E.D.N.Y. Oct. 15, 2008). Rule 37 sanctions require a showing of violation of a court order. Daval Steel Prod. v. M/V Fakredine, 951 F.2d 1357, 1363 (2d Cir.1991). Sanctions under the court’s inherent power require a showing of bad faith or willfulness. See DLC Mgmt. Corp. v. Town of Hyde Park,163 F.3d 124, 136 (2d Cir.1998). When deciding a proper sanction, a court generally must consider, in light of the full record of the case, (a) willfulness or bad faith on the part of the noncompliant party; (b) the history, if any, of noncompliance; (c) the effectiveness of lesser sanctions; (d) whether the noncompliant party has been warned about the possibility of sanctions; (e) the client’s complicity; and (f) prejudice to the moving party. Id. In the spoliation context, the court must also consider the “prophylactic, punitive and remedial rationales underlying the spoliation doctrine.” West v. Goodyear Tire & Rubber Co., 167 F.3d 776, 779 (2d Cir.1999). Thus, the sanction should “(1) deter parties from engaging in spoliation; (2) place the risk of an erroneous judgment on the party who wrongfully created the risk; and (3) restore the prejudiced party to the same position he would have been in absent the wrongful destruction of evidence.” Id. In view of the facts in this case, Judge Baer certainly could have imposed the ultimate sanction of default judgment as the plaintiffs requested. But he declined to do so. Id. at *12. Frankly, his stated reasons for stepping back from the brink are not too persuasive, essentially saying only that “such sanctions ‘should be imposed only in extreme circumstances, usually after consideration of alternative, less drastic sanctions.’ West, 167 F.3d at 779.” For that reason he imposed the lesser sanction of only striking the safe harbor defense. Still, in this case, that was a distinction without a difference. Striking the defense here had to result in entry of the final summary judgment. Thus, by restraining the sanction somewhat, the judge made the order stronger and far more likely to survive appeal. Clever move for a land lubber, proving that once again Captain Reynolds has met his match. 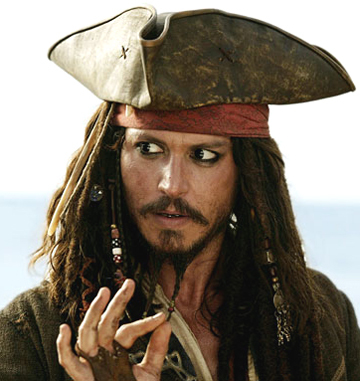 Digital pirates are like all other e-discovery scallywags. They think they are smarter than everybody in the room, and they usually are, that is until they end up in a court room with competent opposing counsel. They know a little bit about computers, or maybe they know a lot, and so they think they can get away with wiping hard drives or some of the other tricks shown by Reynolds. But they don’t realize that when it comes to computers, there is always a forensics expert who knows more than you do. These excuses all amount to the same false logic, that the ends justify the means. In a legal system, the means – due process – is an end in itself. Just ask the lawyers, judges, professors, and other citizens of Iran, Pakistan, and countless other countries that have or had no due process, where anyone, even the judges, can be arrested and jailed at the whim of a dictator. The rules and law governing procedure in all legal proceedings, criminal and civil, are essential to our way of life. They must be followed, even if it means disclosing evidence that you think might help your enemy to defeat you. These procedures, which in the case of e-disclosure typically means disclosing emails you’d rather not, must be followed by all sides to a dispute, not just one. If one side is caught cheating, the court must respond with harsh sanctions, as it did here. For otherwise, one side may be punished unfairly for following the law and another rewarded for breaking the law. Judges bear a heavy burden to actively police their courts to insure that this does not happen. Courts and discovery must be pirate-free zones, which to me seems like a Fiddlers Green. Well! I’m actually feeling rather good about this. I think we all arrived at a very special place eh? Spiritually. Ecumenically. Grammatically. Based on this evidence, it is clear that Defendants’ “wiping” of the Seven Hard Drives was intentional and in bad faith, and their failure to ensure that all documents – including emails, to the extent they existed – were preserved before intentionally disposing of employees’ hard drives was at least grossly negligent. Here, where internal documents concerning, among other things, marketing plans, reports and assessments of the popularity of user newsgroups and communications with users are among the most critical in assessing Defendants’ knowledge and fostering of, or material contribution to, copyright infringement, there can be no doubt but that the despoiled documents were highly relevant to this case. Moreover, when evidence is destroyed in bad faith or with gross negligence, that alone has been found to be sufficient to support an inference that the missing evidence would have been favorable to the prejudiced party, and thus relevant. See Residential Funding Corp. v. Degeorge Fin. Corp., 306 F.3d 99, 109 (2d Cir. 2002). The next step in the case is briefing to determine the terms of the Final Judgment. The judgment will include a permanent Injunction and damages. Then it will be the appellate court’s turn. We take due process very seriously in America, even for pirates. SUPPLEMENTAL READING: Read some recent news articles and legal articles on computer piracy, especially on music and movie piracy. Did you know there is now a political party in Europe supporting the alleged right to freely share this ESI? Heard of the slogan “Information wants to be free“? What do you think? Ever download a piece of music you did not pay for? A video? A software program? Do you think this should be criminal? Is it now in the U.S.? What do your friends think? Are any of them pirates? EXERCISE: Consider whether too much due process was afforded the defendants in this case? Did they deserve it? What would you have done differently if you were the judge? Are there still pirate websites offering free music and movies to the world? Any idea how many? Any idea why the laws are not working? Any idea where the servers for these websites are located? How do the owners of these webs try to protect their users from prosecution? What should the media industries do differently, if anything? Don’t the creators of music and movies deserve to be paid for their work? Talk this one over with your friends. Finally, how would you go about getting discovery in a lawsuit from a pirate website?